Left to Right: Ashley D. Kelley, J. Cameron Barnett, Christiana Clark, Rodney Gardiner. Photo courtesy Jenny Graham and Oregon Shakespeare Festival. The Oregon Shakespeare Festival’s adaptations of classic musicals are frequently highlights of the season. The shows go beyond just pleasing crowds; directors explore the context and meaning of each musical and use the Festival’s resources to bring their interpretation to life. OSF combines the glamour of classic musicals with an outstanding ensemble cast to create a fun, enchanting production of The Wiz, the musical that unites L. Frank Baum’s children’s book The Wizard of Oz with the African-American musical styles of the mid-1970s. Any adaptation of The Wizard of Oz relies on the likeability of Dorothy, who in this production (through August 13) is played by Ashley D. Kelley. Kelley’s portrayal is everything one would expect from the character – a Dorothy not without her faults, but brave, kind, and principled. She serves as not only the protagonist, but also the foil to many of the goofier characters in the play, which makes her determination as funny as it is charming when compared to that of the weaker-willed characters. Within Dorothy’s party, the standout character is the Cowardly Lion (Christiana Clark). Clark zeroes in on her character immediately – a coward who serves as comic relief, but honestly tries to improve – and goes 100% into her rendition. The Lion steals the show in almost every scene she’s in, and is also responsible for some of the funniest jokes in the show. That said, the Scarecrow (J. Cameron Barnett) and the Tinman (Rodney Gardiner) also put in great performances, and the four of them (including Dorothy) make a fun, lovable group. 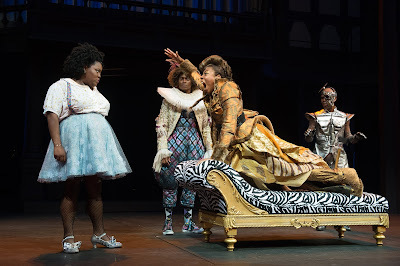 Much like the original book, three witches appear throughout the story; however, the Good Witch of the North (Michele Mais), named Addaperle in this production, gets significantly more time onstage than in the source text. Addaperle is the most direct indication that The Wiz is a loving satire of The Wizard of Oz instead of a faithful adaptation, with a lot of metahumor and jokes about her disappointing magical power – Mais delivers the straight-faced performance required of her. Also notable is the Wicked Witch of the West, Evillene (Yvette Monique Clark), whose gleeful villainy and sheer power are as thrilling as they are terrifying. One cannot write about this show without discussing Jonathan Barbour’s Wiz. Barbour’s charisma and musical performance in his introductory song, “So You Wanted To Meet The Wizard” make it one of the most memorable parts of the show, and he maintains high energy for the remainder of the play. His consistently high internal status is an unexpected twist on the famously insecure character; even when found out as a fraud, the Wiz continues to believe that he is significantly more powerful than everyone else. It’s an unusual interpretation that works well considering the show’s focus on confidence and belief in oneself. Drawing from traditions of glitzier Broadway musicals, The Wiz discards any sense of modesty and goes completely over the top with its presentation. Lines of glamorous chorus dancers dressed in glittery lightning-bolt outfits become the tornado that whisks Dorothy to Oz; later, the same dancers wear suits of golden sequins to become the Yellow Brick Road. The costumes of Oz denizens are elaborate almost to the point of camp: the Tinman, for example, has a hat that looks like a can top and a Terminator-esque laser eye, and the Wiz’s costume in his first appearance defies description. The sheer audacity of these design choices is entertaining on its own, but the clothing is not without meaning; for example, costume designer Dede M. Ayite made the intelligent decision of dressing Dorothy in plain, regular clothes, accentuating the contrast between the girl from Kansas and the strange land she visits. The Wiz at OSF is more of a conventional musical than some of the Festival’s previous work, like the “backstage” My Fair Lady or the gritty The Unfortunates. The most direct comparison would be to 2010’s She Loves Me, which also used a set and theme that were fairly standard. However, the production values, wonderful cast, and sheer heart put into this show make it an absolute must-see. If you’re looking for a night of pure entertainment, this show is difficult to top.